Metal Bellows expansions joints are compensating elements used for thermal expansion and relative movement in pipelines. They consist of one or more metal bellows, connectors at both ends, and tie rods that depend on the application. To increase both flexibility and stability, multiple thin plies of metal are layered to form the bellow walls. There are two basic design types : The multi-ply and the multi-walled bellows structure. The axial expansion joint absorbs movement in an axial direction. Standard connectors of the axial expansion joint are welded ends, fixed flanges and loose flanges. 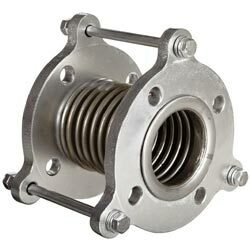 The universal expansion joint can absorb not only axial movements but angular and lateral movements as well. It consists of two metal bellows with an intermediate pipe and connectors on both sides. It is usually used to compensate large axial and lateral movements at low pressure. Material : SS304 , SS304L, SS316, SS321 etc.